Industry advocates often talk about wind farms contributing revenue to local communities, so it’s nice to hear specific and tangible examples of wind power at work on the ground (that is, as opposed to 80-plus meters in the air, working to generate clean electrons). So here’s one. In Ohio Iberdrola Renewables, along with State Senator Cliff Hite and State Representative Tony Burkley, this week presented checks to local officials in both Van Wert and Paulding counties to commemorate the first of the annual payments the wind power company’s Blue Creek Wind Farm will be making to the counties. Speaking of tangible examples, it’s interesting to take a look at both the sheer dollars contributed as well as how those funding levels are calculated (usually by number of turbines). Iberdrola injected Van Wert County, which hosts 115 turbines, with over $2 million, making the wind farm the largest single taxpayer in the county. That figure, in fact, is equal to the current top 11 revenue contributors combined as of 2012. Wind farms often generate revenue for communities that need it most, and so the statistic concerning the top 11 revenue contributors is a case in point. Paulding County, meanwhile, received $666,000, based on the 37 turbines located in the county that each pay $18,000 per year. As the wind farm is spread across two counties, six townships – Tully, Union, and Hoaglin in Van Wert County and Benton, Blue Creek and Latty in Paulding County – and four school districts, the project’s contributions to localities will be spread far and wide. The townships will each see an average of $1,400 per year per turbine. With 76 wind turbines, Union Township will see a revenue boost of 25-30 percent in 2014 compared to 2013. The school districts will see the lion’s share of revenue. With 81 turbines spinning within its boundaries, Crestview Schools will see about $850,000 per year in new revenue, a boost of about 10 percent. Now, just imagine the additional community revenue trickling through from the 500 jobs created during construction, the $25 million spurred in local spending, the 30 local companies that worked on the project, et cetera et cetera. Those are some good, tangible benefits. And we haven’t even begun to talk about what the wind farm is built for, the product it will give the region: clean, fuel-free electrons. Friends of the Paulding Chamber, Inc.
Iberdrola is not unique among developers in its good-neighbor giving. First Wind, for example, is just one name that comes to mind for reaching out to the community in multiple ways. Does your company have some community-participation information you’d like to share? Share your story in the comments. 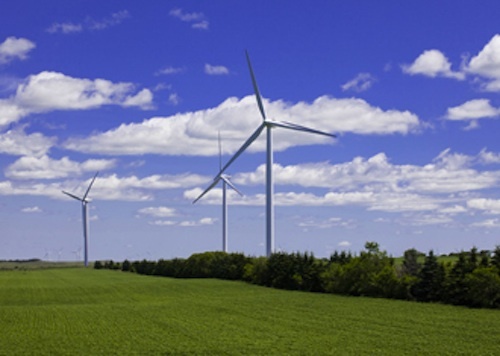 This is cross posted from AWEA’s Into the Wind Blog written by Carl Levesque.